As part of JPMorgan Chase’s $13 billion settlement with the U.S. Department of Justice and five states (Chase RMBS Settlement), independent Monitor Joseph A. Smith, Jr. is overseeing Chase’s agreement to provide $4 billion to distressed homeowners. 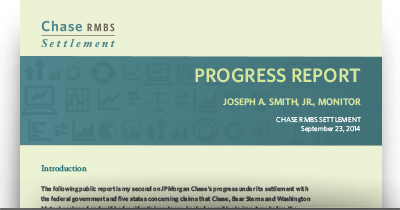 Joseph A. Smith, Jr., released his ninth report on JP Morgan Chase's progress under its residential mortgage-backed securities (Chase RMBS Settlement). The Monitor released his final report on the JPMorgan Chase RMBS Settlement September 22,2016.